just a quick mothers day card to share today.I will not call these as 'not my style of cards' anymore,because i started liking these kind of cards,and i am enjoying a lot in the learning process of making these kind of cards.The pattern papers,elements and alphabet stickers,journaling tag everything is from echo park For the record kit,..i just loveeeee this kit ,all the papers were amazing.I got loads of may arts ribbon last year along with my cuttlebug,but believe me i have not used one so far,every time i take them n don't feel like using it and keep it inside ,they are just beautiful and finally i used one today,lol.Yesterday evening i left all my other works n making this card very fast based on play date cafe's colors thinking today is the last day,after finishing the card only i realized the challenge was already over yesterday morning,..i was like grrrrr,...anyways i liked the outcome so no issues. 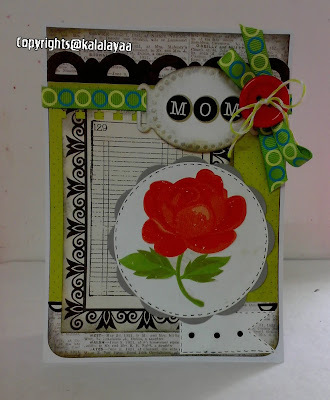 Love the color combo,grey,lime n red,..amazing,..and the card is based on mojo monday sketch,..just too good and i can already see lots of cards based on this sketch. Supplies:Spellbinders dies-scallop circle,circle,ribbon tags,papers-echo park n prima,ribbon from may arts,some twine n ribbon,Stmps-book it from ippty. P.S:Don't forget to enter the Coloring challenge to win some amazing pie lane goodies. Don't forget to enter my final huge candy too..
hmm...quite different from your signature style....bt nevertheless...very pretty. this is very pretty such eye catching flower and love the ribbon. Very very stunning!! I forgot to say I just got your card and my God!! its such wonderful work..superb layering!! Nice card and colors. Thanks for joining Sweet Stamps. Like your use of colours. Lovely mother's day card. this is so so pretty di ! I know just the feeling you have described when you like some stuff in your craft supplies so much, many a times you just dont feel like using it! Lovely ribbons. Such a lovely card...love the different elements on it! Love this card, so bright and cheerful. Thanks for joining us at Happileigh Scrappin' this week. Very pretty, I love the shabby chic look. 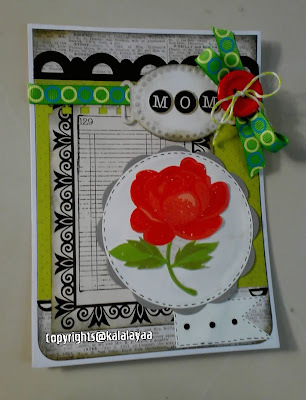 Thank you for joining our challenge at SweetStamps.com. Wow! This is a gorgeous card! Great work Kavi! great card. and I love the poodle. hes too cool. Thanks for playing along on FOr fun. lovely card kavi! loved the color's!! Such a fabulous card. Love the pop of color against the text and ledger prints. Thanks for playing along with Mojo Monday! 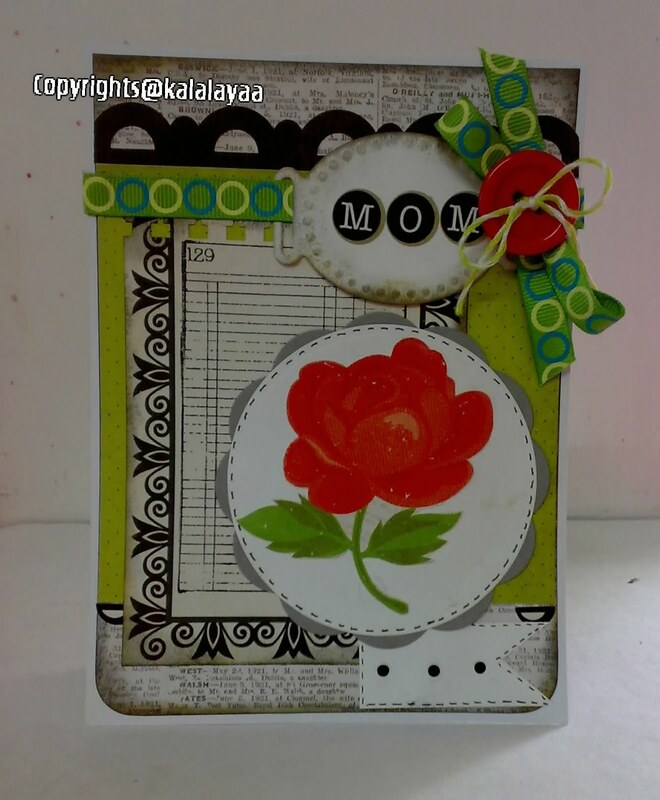 Kavitha, what a lovely card, that is a gorgeous rose. Sadly the rules at Sweet Stamps limit you to 10 challenges per entry to be elibilbe to win the prize. Perhaps you will visit us again. What a birght, happy confection for mother's day! Your use of color is fabulous! Thanks for playing along with Divas by Design this round! FANTASTC!! I love everything about this card! so many wonderful details...I luv this...great card...hope your day is fantastic! Great card!! Thanks so much for joining us at Papertake Weekly! 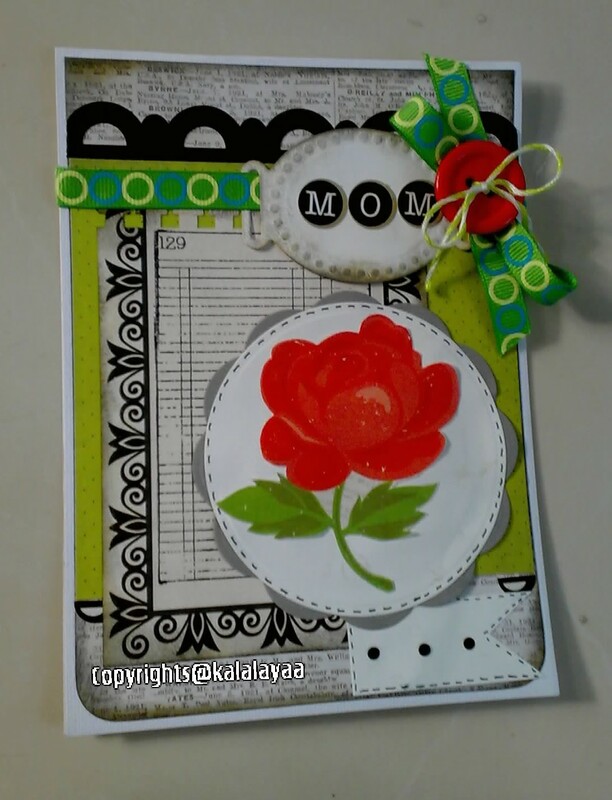 Right you are, these colors are outstanding, great entry for Diva's by design challenge this time, see you again next time I hope, your cards are lovely. Good luck! Very pretty colors. I like all the brights together. Love the rose. This is so pretty. I love the green and red colors. It looks fantastic! Thanks for joining us at Tuesday Throwdown. This is beautiful! Love the rose! Thank you so much for playing with us at Happileigh Scrappin'! Very pretty. Thanks for playing along at Amber's Crafts and Stuff.